The Howard Theatre, the historic arts landmark that launched the careers of Duke Ellington, Ella Fitzgerald, Marvin Gaye and The Supremes, announces their grand re-opening after a $29 million renovation with a star-studded opening gala and lineup of top-tier events. The Howard Theatre will re-open the week of April 9th with performances by Wale, The Roots, Robert Randolph, Taj Mahal, Yasiin Bey (aka Mos Def), Meshell Ndegeocello, Bad Brains, Chuck Brown and comedienne Wanda Sykes. On April 12th, the new venue will host a Grand Opening Gala Fundraiser presenting performers from the Howard Theatre’s past and future including Smokey Robinson, Al Jarreau, Madeleine Peyroux, Savion Glover and many more. The event will honor famed Motown Records founder and producer Berry Gordy, who will be in attendance. A full slate of wide-ranging performances in the 12,000 square foot, 650 seat (1,100-standing room) theatre will continue with a lineup that includes Chuck Berry, Chaka Khan, Esperanza Spalding, Jack Bruce, Boyz II Men and a weekly Sunday Brunch featuring the Harlem Gospel Choir. The scheduled lineup is listed at the end of this release. 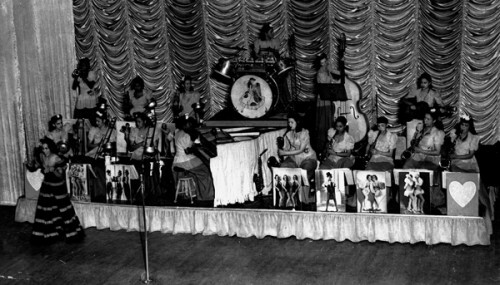 The Howard Theatre will be operated by Blue Note Entertainment Group, the owners and operators of clubs and theaters around the world which include the Blue Note Jazz Club, B.B. King Blues Club and The Highline Ballroom in New York. The Howard Theatre features a regal windowed façade, originally incorporated into the structure in 1941, and combines elements of Beaux Arts, Italian Renaissance and neoclassical design. The balconied interior is built with flexibility including supper club-style seating for approximately 650, which can be quickly removed through elevated hydraulic platforms to allow standing room for 1,100. The new configuration, with black walnut walls, oak floors and Brazilian granite bars on each level, features a $2 million state-of-the-art acoustic system, 10’ video screens and recording capabilities allowing The Howard to retain the intimate feel of its former 1,200-seat space, while appealing to both traditional and digital-age audiences, be it for a live performance, a private gala or a political fundraiser. A deeper stage, basement and additional wing space provides for enhanced set preparation, gourmet kitchen and administrative office space. A 600-square-foot museum and gift shop will showcase memorabilia, photos and videos of the astounding array of artists and guests who graced The Howard in years past. 100 dedicated parking spaces will be available at the neighboring mixed-use development, Progression Place. In addition to first-rate entertainment, the Howard Theatre will feature a full dining menu designed by consulting chef, Marcus Samuelsson , the youngest chef to ever receive two three-star ratings from The New York Times . In addition to designing the dinner and brunch menus, Marcus and his team from the Marcus Samuelsson Group will assist in the appointment of the Theatre’s executive chef and develop the training program for the culinary staff. 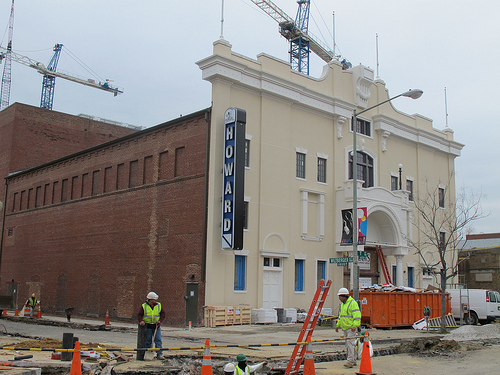 The Howard Theatre will begin its opening with the Howard Theatre Community Day on April 9th, featuring live music performances, memorabilia displays and tours of the theatre. A memorabilia drive is currently underway, in which members of the community are donating tickets, posters, and souvenirs from the theatre’s past. The Grand Opening Gala and Tribute Concert will be held on Thursday, April 12, 2012. 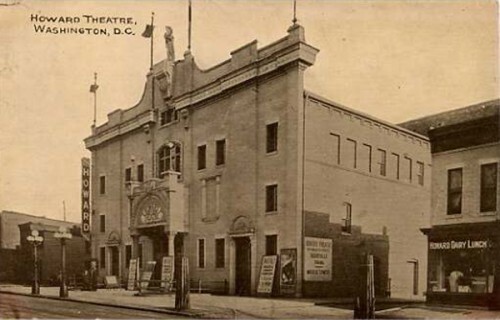 A fundraiser for Howard Theatre Restoration, the 501c3 charged with preserving the building and history of the theatre, the event will feature a full line-up of legendary music, comedy and dance performances. “This will be a memorable night of entertainment that will officially raise the curtain of the Howard, celebrating the great history of entertainment at the theatre while looking toward its magnificent future,” says Ellis. In addition to its opening evening performance lineup, the theatre will also host Sunday Gospel Brunch featuring the Harlem Gospel Choir, a completely seated, weekly gospel concert and brunch for $35 including a full Southern-style buffet brunch. Sunday Gospel Brunches will begin at 12:30 each Sunday starting April 15. A complete list of scheduled talent and ticket pricing can be found at the end of this release. Tickets for all scheduled events will be available for purchase beginning February 27th at www.thehowardtheatre.com. The Howard Theatre is located at 630 T Street NW, 620 T Street NW, Washington, DC, www.thehowardtheatre.com.